Text and images by Amy Christie for Design Mom. It’s getting to be that time of year again: handmade gift-making season! This year, we thought it would be fun to try a new creative tool, a dremel (or you could call it a wood burner), a heated tool used for etching and drawing on wooden surfaces. For the next three days, I’ll be sharing cool and easy projects using this one tool (find the second project here). First up, mixing spoons! 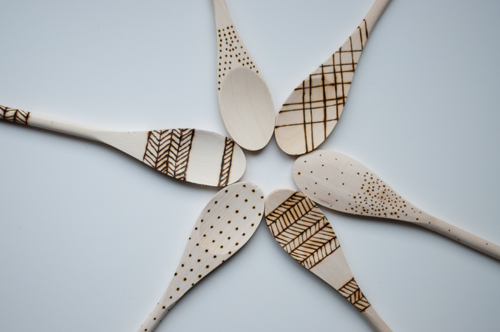 Inspired by this project, I thought it would be interesting to see what super simple designs — dots, plaids and hatched arrows — looked like on etched wooden spoons. And they turned out so great, I thought they’d make a gorgeous gift! Since I had never tried one before, I found it fascinating to work with the etcher — it’s a whole different way to alter an object. And you guys are lucky, because after my experience with these projects I can offer some advice. As a warning, it does get crazy hot and can 1) burn skin, 2) burn a whole through clothing and 3) make burn marks on anything it comes into contact with. Only two of these items are inspired by personal experience and I’m embarrassed enough not to tell you which two. : ) So please be careful! That said, don’t be intimidated. It was actually really easy to work with. Just be careful, and when you aren’t actively using it, rest it on a surface that won’t burn. 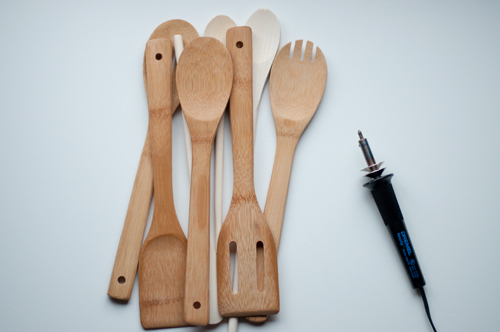 And of course, make sure to unplug it when you have finished your etched wooden spoons. Also, there is a good chance that when you finish, you will smell like what I imagine Smoky the Bear smells like — burned wood. So crack a window, turn on a fan and pretend you’re enjoying a bonfire. The result is well worth it. Plug in the Dremel and let’s get going! 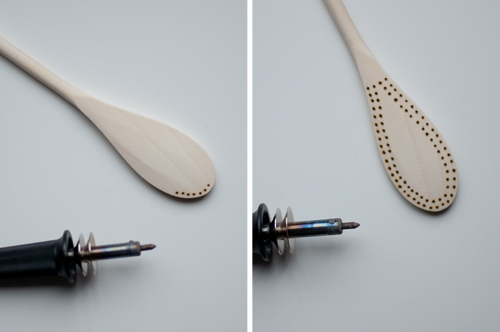 – Wooden spoons. I bought a cheap-o pack from the store and ordered a little nicer set online for about a dollar each. – Etching tool. I know. A 20 dollar investment, but it gets great reviews and I think I’ll be able to use it ton. You could even share it among your crafty friends. There isn’t much to direct here, and no templates needed. It’s that simple. You can use my designs as a reference, or free hand a design from your imagination. 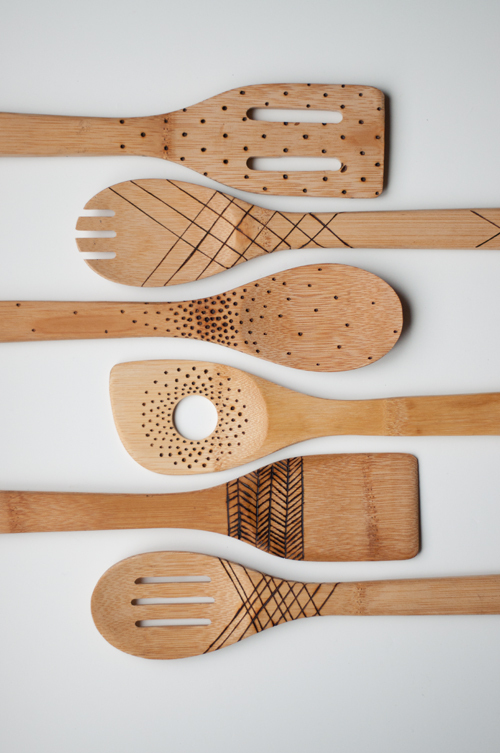 If you are more comfortable, you can trace a design or use a pencil to sketch on the spoon what you intend to do first. Then put the tool to the wood and make it come true. If you want, make a little symbol, like an artist’s signature, somewhere on the spoon (I used my signature heart), because it’s a piece of art! Then tie them up with a ribbon and the gift is ready. – A house warming gift. – A birthday gift for a baker. – A Mother’s Day gift topper. – Party favors for a kitchen-themed party or shower. P.S. — Like to make gifts? Check out our Perfect Gift series. Wow — very cool! Great gifts! Wow, what an amazing idea… I am searching for something special for my mum to give it to her for christmas… This sounds so nice! I will try it out! This really is the perfect gift!!! You kind of read my mind with this project, only it came out even cuter than I envisioned! One more tip for folks unfamiliar with using a wood burning tool – once the design is burned in, chances are great that it won’t come out again. You can *try* to use a razor blade, but sanding won’t cut it…the burn tends to go down much further than most people suspect. I have an Etsy shop selling wood burned items, and this is spoken from my own experience ;) So try to have at least a basic idea of what you want *before* you start burning! Ton blog est vraiment très, très sympa! J’aime beaucoup ce que tu fais et ça me donne plein d’idées! Merci beaucoup! here’s to a clever & creative christmas! Thanks for the creative gift idea! Does anyone have other craft ideas for other uses for the dremel? I have a dremel! Woohoo! This is seriously my favorite thing ever. Totally doing it. Thanks! I could not love this more. I am doing it! I had a wood burning kit when I was a kid and LOVED it. Time to get one for my grown-up self! This is seriously my favorite DIY yet! We made these for the grandparents a couple years ago. I traced the outline of a spoon onto paper, my daughter decorated it, and then I transferred her drawing onto the spoons with the dremel. They turned out cute. Thank you for a great idea! I’m just buying the supplies for my kids to make these for the grandma’s for Christmas. Wasn’t exactly sure how I was going to make it safe and turn out well, but this seals the deal! I love this! I was about to buy a wood burning kit the other day and didn’t. Now I;m going back to get one! You did a great job. For the first time in my life I am seriously thinking about purchasing a dremel; an instrument whose name I was never aware of before now. I adore this Amy! I actually have an etcher that I never use, so this is going right on my to make list for Christmas! These are super cute! I love this idea. I’ve never even heard of this type of etching before, but now I really want to try it. My husband makes little faces on my clothes pegs with his wood burner. They are so fun to look at when hanging out the wash. These are so cute, thanks for this awesome tutorial! We’re a shaving company called Dorco and we provide quality razor systems, disposables, and cartridges for 30-70% less than leading brands. Check out our prices for yourself by Googling us! Thanks again for this great tutorial! Wow, I have been making these for a few years and it is great stress relief! Yours are awesome! A few questions–Are you at all concerned about bacteria/ick getting stuck in the grooves? How do you clean yours? Does burning them make them more prone to splitting when washed (ie, more opportunity for water to get inside)? Love it, going out tomorrow and getting a dremel!! I would like to though, how different was the cheapo set compared to the more expensive ones? Did they both work out the same? Do you think this would work on bamboo utensils? Or would the burning have a different effect? These are perfect! I need to get an etcher ASAP. I think you mean, “burn a HOLE through clothing”. I love these! Great idea! Just a heads up for anyone looking to buy this tool – Dremel is a brand name, not a tool name. If you go to a home depot and ask for a Dremel, they will likely take you to the rotary tools, the tool most closely associated with the Dremel name. This is a woodburning tool. That is a really cute idea! Thanks for sharing. Hmm.. I need to buy up a stash of wooden spoons now. Great gift idea! I love the little heart on the ends of the spoons. Thanks to your article, I found the idea to decorate the kitchen spatula. Burn taught me in school. It was so much fun! I came up with snowflakes and Christmas trees for ornament. All the same New Year comes. My congratulations to the future of the holiday! Love them so much, I added you to a DIY gift idea round-up! Love your blog, always. Check it out in the link below. Just finished sketching our some Native American designs and thought what a unique idea to give as gifts this year to our seniors. Thanks for sharing. these were my best gifts! some years, i over do it, but these were perfect – fun to make, including a piece of me (my time), and useful kitchen items. everyone loved them. my family was asking if they could use them, or if they were just for show…as if i made something so nice it was for display only. thank you for the idea. 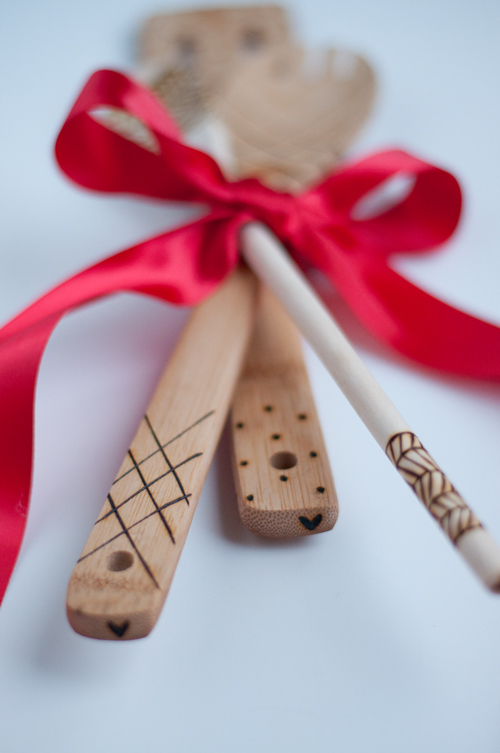 it’s been fun making the utensils and even more fun giving them out! I’m so glad you like them Stephanie! I love knowing about your makings, makes me feel so good! Have a wonderful new year! I made these for grandparents for Christmas this year – and thought I’d report here how it went. I followed the links in the tutorial and bought the same spoon set and dremel tool as recommended. I have 3 kids, ages 3, 5, and 8. I had each kid draw a design directly onto the spoon/spatula with pencil. Then I went over it with the dremel. I thought we would be able to wash off the extra pencil marks, but couldn’t. A white eraser did the trick (regular pink pencil eraser seemed to leave marks and residue). I traced exactly what they drew and wrote on the spoons with the burning tool, 3-yr-old-scribbles and all. 3 grandmas = 3 sets of 3 utensils. This is a perfect, handmade, DIY gift for kids to make! I am wondering, though, if the “burn” smell will fade? Very cute! One suggestion for this post — don’t call the woodburning tool a Dremel. It’s just a Dremel-brand tool. When the word “Dremel” is used alone or as a verb, it refers to a rotary cutting/polishing tool. Looking at the comments, it seems the misnomer has caused confusion. hmmm. as many have mentioned, Dremel is a brand name for tools, esp rotary tools. BUT, if you have a soldering iron, it will do as well. Or a knife heated over the stove… you get the idea.